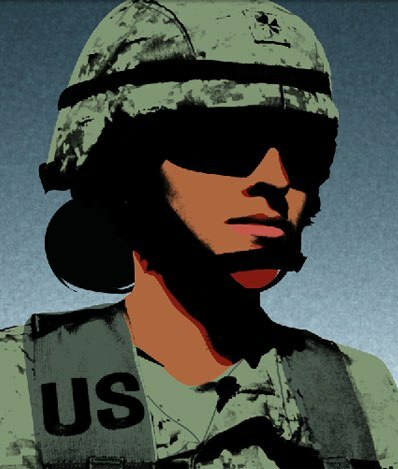 Speaking of Women's Rights: Women in the Military: A microcosm of the struggle for gender equality? Women in the Military: A microcosm of the struggle for gender equality? Though 4-20 may have had other significance for some of you, yesterday was also Equal Pay Day, the day on which women in America finish earning the salary they would’ve received in 2009, were they a man. The disparity between women’s and men’s salaries has decreased only half of a penny in the last 4 decades, hovering right around 80 cents on the dollar. Though there are many theories on why men still out-earn women, I think that the answer lies somewhere in the system; a system that still assumes that women are incapable of any number of things. Take the military for example. Public opinion may be changing, but a 1950’s law that does not permit women to be placed in direct combat is still on the books, leaving them with far fewer job options than their male counterparts (for example, only 20 percent of positions in the Marines are technically open to women), particularly positions of higher ranking and thus higher pay. This doesn’t mean that women are always kept out of harm’s way. What it does mean is that they are stealthily placed in the line of fire, often being “attached” to a unit, rather than assigned to it. Then there’s the issue of advancement, which often requires combat experience. A large portion of women in the military have been involved in combat, but that experience isn’t on the books because – according to the rules – that wasn’t supposed to happen. It seems that, though we’re certainly not there yet, we’ve made strides when it comes to what society thinks women are capable of. Women are successful CEOs, negotiate foreign policy with other nations, and rescue fellow soldiers from enemy fire. Now we just need to bring our antiquated codes and laws in line with the valuable contributions women are making, and pay attention to the more nuanced ways in which policies can contribute to inequality. Only then will women be able to jump the barriers they currently face and join men on the front lines, literally and figuratively. Photo from LIONESS: A film about the first women in U.S. history to be sent into direct ground combat. What’s in that Tea They’re Drinking? Who invited the gender & fashion police? Women's Roles --- Still Up in the Air?